The PDP-Laban presidential candidate Rodrigo Duterte said that he only needed a handshake from Liberal Party presidentiable so they can be friends again and it should be Mar Roxas make the first move. According to Duterte, Mar Roxas does not need to apologize to him, all he needs to do is shake Duterte's hand and that's it. "Hindi na kailangan. Kaming mga lalaki, wala 'yan. Pagsabi, 'O 'dre,' 'pag ganon ng kamay niyan, okay na 'yan." "Siya mauna. Siya nag-umpisa," added by Duterte, because according to him Mar started the word war particularly in his statement over Davao City peace and order is only a myth. "Apology eh siya nanguna. Sabi niya ganon ang Davao, it's a myth. I did not start the verbal tussle. He was the one. Alam naman niya. Siya 'yung pulis. He heads the DILG. Under niya ang pulis." "Three months before he resigned, binigyan niya ako good governance. Number one sa good governance kasama doon housekeeping, tourism, peace and order. Bakit mo ko ilagay number one good governance? Kaya ako naano. Baka nakalimutan mo, ikaw ang nagbigay ng award sa akin," Duterte said in his interview, Tuesday night at the National Unity Party in Quezon City. Aside from this issue, Mayor Duterte was been advised by his doctor to not engage to a fistfight because he has a mumps according to his doctor. He said, "Nag-konsulta muna ako sa doktor. Sabi niya wag ka muna makipagsuntukan kasi may mumps ka. Baka tamaan." According to GMA News, there's a contrary on what Duterte said before about the gunfight challenged with Roxas. He told earlier that he did not challenge Roxas to have a gunfight because Mar doesn't know how to use it. He said, "'Yang mga barilan para sa kriminal 'yan. Ito si Mar mag-Presidente na nga eh. Hindi naman siya marunong magbaril. Bakit ko siya hamunin ng barilan?" And also on Tuesday, the slapping issue became a challenge to a fistfight because of Mar's statement. 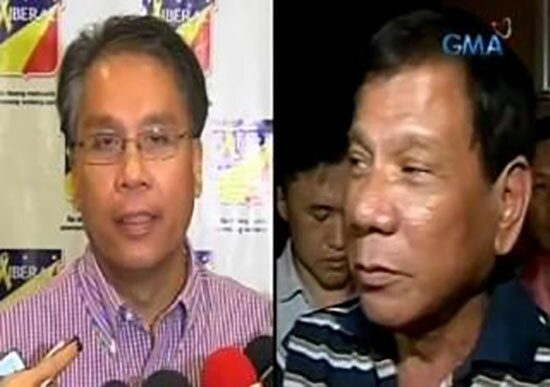 Mar said, "Gawin mo na lang kung anong gusto mong gawin. At sampalan? Bakit pa sampalan, pambabae ‘yan, suntukan na lang. Di ba? Simpleng-simple lang ito." On the other hand, Duterte challenge Roxas to a gunfight rather than a slap-fest or fistfight. Duterte said, "Barilan na lang, "Ang mga mayayaman takot 'yan mamatay. Ano naman ang katatakutan ko." Do you agree that Mayor Duterte has a point on this issue? Share your thoughts below. Comments or suggestions about "Duterte only need is a handshake which Mar should make the first move" is important to us, you may share it by using the comment box below.